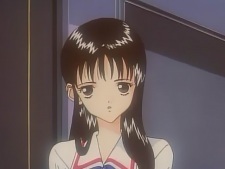 Azumi is an innocent and average looking young high school girl. However, after moving from Kyushu to a new city and new apartment complex she meets Chizuru. At first the friendly Azumi tries to be nice to Chizuru, only to be harshly rejected. Eventually though, the two become friends, although Azumi fears that there might be something weird about Chizuru. Azumi, who wishes to become a screenwriter, one day attempts to join the drama club. There she befriends a young, amateur film maker named Ryuichi Kobayashi.